In Ketchikan, we are fortunate to be situated with close access to several major salmon spawning streams that hold all 5 species of Pacific Salmon. Our typical run for a 4 hour cruise ship charter is only about 3 miles from downtown Ketchikan or about a 20 minute boat ride, so literally within minutes of getting on the boat, you can be in pristine Alaskan wilderness catching countless wild Salmon to your hearts content. Although the chances of catching all 5 different species in the same day is unlikely, they are all present in the waters around Ketchikan. The King Salmon are the thickest in May and June, the Pink Salmon in July and August and the Silver Salmon in August and September. The beauty of fishing for salmon in Ketchikan, is that at any time during the summer, you have a very strong chance of getting into some fish. Of course, there are factors and circumstances that can make fishing more difficult such as the presence of Killer Whales, bad weather and high winds or even on occasion the lack of very many fish; but one thing you can be sure of: if it is safe to go fishing then Captain Jim will do his very best to put you in a spot that you are likely to catch them. 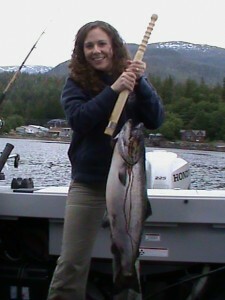 We are frequently asked, “When is the best time to come fishing in Ketchikan?” and the answer is a little complicated. If you are looking for a real trophy, a once-in-a-lifetime fish, then you definitely want to come fishing for King Salmon the last 2 weeks of June. This is the period of time when they are available in the highest numbers and when we see some of the real monsters get caught. If you are just looking to take home as many pounds of salmon fillets as possible then you probably want to come in late July or early August when the Pink and the Silver Salmon are running. These fish are often caught at the same time and on many days you can fill your cooler to overflowing and get countless pounds of fish each day you go out. Whatever your goal is, Captain Jim can help you achieve it so Contact us now to figure out the details!